The IKEA Lack Coffee Table is a simple and hard-lined particleboard coffee table with an included storage shelf. Designed by IKEA, the IKEA Lack Coffee Table is a functional living room item that provides additional storage space for various common objects, books and magazines. The IKEA Lack Coffee Table has a height of 17 3/4” | 45 cm, length of 35 3/8” | 90 cm, and width of 21 5/8” | 55 cm. The table is constructed of particleboard and fiberboard, and is available in a range of colors. What is the IKEA Lack Coffee Table? The IKEA Lack Coffee Table is a simple and hard-lined coffee table with an included storage shelf designed by IKEA of Sweden. 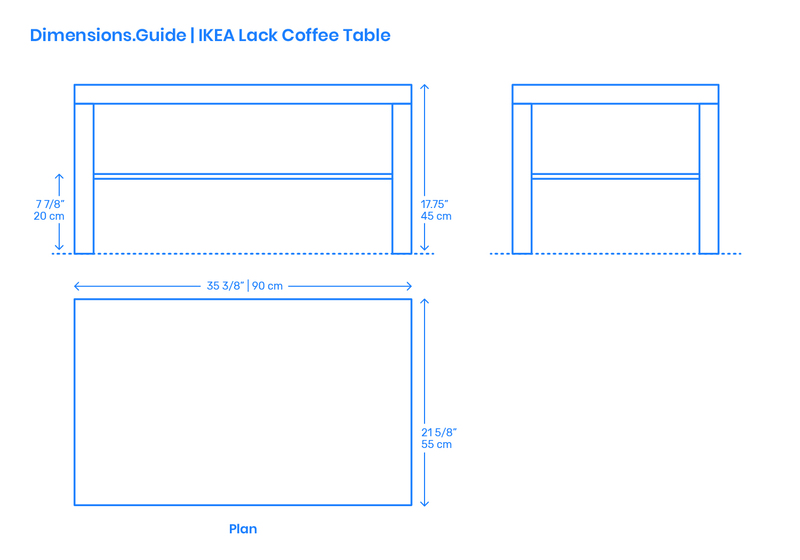 How big is the IKEA Lack Coffee Table? The IKEA Lack Coffee Table has an overall length of 35 3/8” | 90 cm, width of 21 5/8” | 55 cm, and has an overall area of 5.3 ft2 | .5 m2. What height of sofa should be paired with the IKEA Lack Coffee Table? The IKEA Lack Coffee Table has a tabletop height of 17 3/4” | 45 cm and should be paired with sofas with seat heights between 17 3/4”-19 3/4” | 45-50.2 cm.